The Freedom Make Up Prostudio Priming Water is one of the latest offerings from Freedom Make Up (which is a sister company of one of my favourite budget beauty brands Make Up Revolution), The Freedom Make Up range is a much more ‘professional’ product type, ranging from fancy kits, sleek brushes and products like the priming water spray. 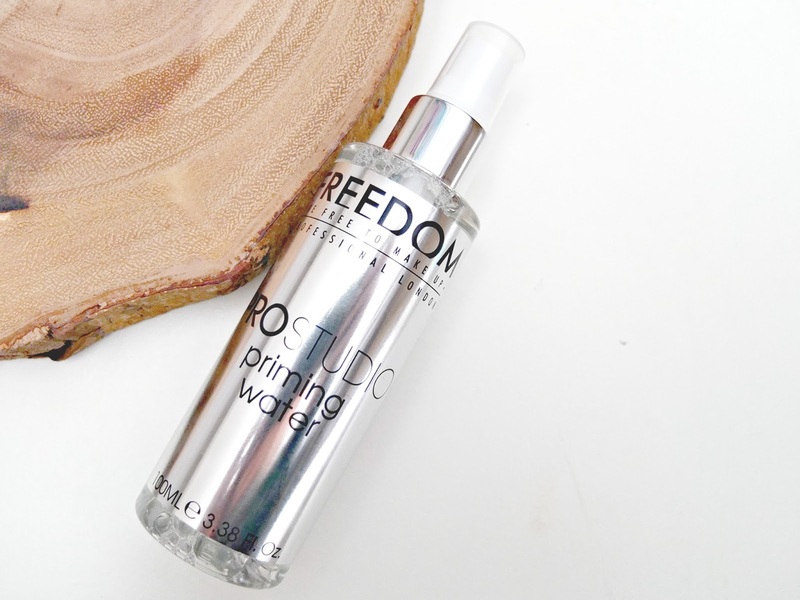 Those with a keen eye for dupes amongst us may note that this priming water bears a striking resemblance to the Smashbox Photo Finish Primer Water, which retails for around £29. Freedom have developed this formula to set you back a mere £6. As this product is a little different in concept to others on the market, it’s always great to find affordable dupes before you invest as you never quite know if they’re going to be good or not do you?! Although it is a primer water, I think this may give the wrong impression about what it actually does. When you use primers in your make up routine, the idea is for it to act as an ‘undercoat’ for your ‘top coat’ of foundation to stick to and last longer. The concept of the primer water is more to do with ‘priming the condition’ of your skin, to make sure it’s hydrated and fresh to apply your make up over. You can also use sprays like this as a mist over your make up to diffuse your final look and add a soft dewy finish to your complexion – very similar to the Pixi Glow Mist or Jurlique Rose Water Mist. I’ve been using this for around 2 weeks now and do really like it! Although it’s not a new concept for me personally, as I’ve been using hydrating mists underneath and on top of my make up for a while, this sits amongst my favourites and the smell is lovely and fresh. Almost like some kind of sweets? But I can’t put my finger on which ones! I think products like this are amazing for this time of year too, when the wind and wet rain can really play havock with your skin, especially when sitting in an air conditioned office all day too. Overall, a lovely and refreshing product for a bargain price if you’re intrigued in the ‘real’ thing!